The Times ran a lengthy article about Tebow, when he entered the NFL and struggled as a QB: "In Tebow Debate, a Clash of Faith and Football". Tebow was still over the top in his religious ostentation, almost Pharisaic in it, dare we use the term. And the Times used this instance to open a much needed discussion of religion and sports. 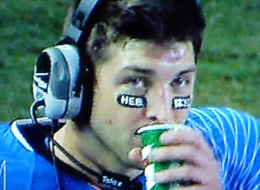 We have the greatest respect for Florida quarterback Tim Tebow as an athlete and as a humanitarian. He sets a great example for all of us. Just one tiny little thing Tim. You had inscribed for all of us to see during the championship game last year in the black glare block under your eyes the reference to "John" under one eye and "3:16" under the other. No and yes. According to the Times, the young (former) conservative is being brought up as a Christian. So no, definitely Jonathan Krohn is not Jewish by religion. Update: At 17, Krohn was doing teshuvah - repenting his conservatism - i.e., he adopted liberal ideas and went to study philosophy at NYU. MSNBC reported in the video clip below, wherein Lawrence O'Donnell lauded him for converting to the "bright side". The Jewish Channel's Steven I. Weiss reports that it turns out that Broyde himself (posing as David Weissman) circulated the story that he was being considered as a candidate for the British Chief Rabbi post. And so it was Broyde who called Broyde "the finest mind of his generation" in the name of Norman Lamm in a claim to a reporter at The Times of Israel on 8/8/2012. More on all of this here. Isn't that nice. But we wonder now. Why stop there if you are making all of this up? Why not have Rabbi Lamm call you, "The Greatest Jew Since Moshe Rabbenu"? Or why not have the Lubavitcher Rebbe call out from his grave and proclaim that you indeed are the Messiah and that he is but your humble servant? We wrote about a book by Michael Broyde in 2011 and reposted it in 2012. The Times of Israel reported (8/8/12) that Rabbi Michael Broyde "emerges as frontrunner for British chief rabbi post." A "source close to the search process" supplied information on the process to the TOI including this tidbit, "There has also been strong lobbying for Broyde by the chancellor of Yeshiva University, Norman Lamm, who in a letter called Broyde 'the finest mind of his generation,' says the source." The Jewish Channel's Steven I. Weiss continued his outstanding investigative reporting with a new story on Rabbi Michael Broyde of Emory University, "Investigation Reveals Additional Questionable Identity With Connections to Broyde’s Scholarship". It now appears certain that Broyde invented letters by two imaginary rabbis to support his opinions on religious matters. Weiss also found that an 83 page article published by Broyde in the journal Tradition was bolstered in part by evidence from Broyde's manufactured authorities and was published with subventions funded by Emory and the Templeton Foundation. The Broyde matter has reminded us of Morton Smith, another professor at a major university who went to great lengths to invent a religious letter to boost his reputation and his scholarly agenda. Wikipedia summarizes the Smith matter in an article that starts, "Morton Smith (May 29, 1915 – July 11, 1991) was an American professor of ancient history at Columbia University. He is best known for his controversial discovery of the Mar Saba letter, a letter attributed to Clement of Alexandria containing excerpts from a Secret Gospel of Mark, during a visit to the monastery at Mar Saba in 1958." Along with many other professors of religion, we believe that Smith's discovery was an intricate hoax that he perpetrated out of some unknown and twisted scholarly motives. Smith was quite clever in committing and defending his deception. And there remain a few scholars who still accept the authenticity of Smith's find. Weiss now has proven conclusively in his reporting that Broyde committed equally intricate academic hoaxes. In our view though Broyde's hoaxes are far less clever and dramatic than Smith's. Folks who want to get in better shape and eat healthier are often encouraged to make one change at a time, but a new study finds that people are the most successful when they tackle their diet and exercise habits simultaneously. "It comes down to making them both priorities and thinking about both throughout the day," says lead researcher Abby King, professor at the Stanford (University) Prevention Research Center. Free: Updated, revised version of Pirkei Avos with the complete Hebrew text of the Perek and Reuven Brauner's translation. He says, "I added footnotes based on the commentary of Prof. Hanoch Albeck in his commentary on Mishna, which I found succinct and enlightening." The new Pirkei Avos is now more useful and user-friendly, and looks wonderful when printed out. Nice for these days between Pesach and Shavuous, too. Great to read to the kids at the Shabbos table. In politics a "bully pulpit" is considered to be a good thing. In the synagogue, mosque or church a "bully in the pulpit" is not a good thing. The term "bully pulpit" was coined by President Teddy Roosevelt to describe the White House as a superb platform from which to propound a political agenda. Roosevelt used the word bully to mean "wonderful" a common adjectival usage in his day. Now we use bully mainly as a pejorative noun meaning a ruffian who harasses the weak. Bullying among children in schools is recognized today as a serious problem. Based on what we have seen and read lately, bullying by clergy from the pulpit is a serious problem too. It is fairly likely that you or one of your neighbors goes to a synagogue, mosque or church where the spiritual leader is a bully. The signs that your clergyman (or woman) is a bully are straightforward. He engages in name-calling, often subtle, via sarcastic or cynical stereotyping of those groups or individuals who oppose his view of the world. He makes you feel uncomfortable and insecure by characterizing classes, congregations or parties of people as dumb or incompetent, if not outright evil, by dint of their political or religious affiliation or preference. And hence you may feel that you could be next in line for his bullying if you say or do something that he decides is wrong. Bullies gang with their cronies to insult and denigrate others. By staying silent or by cheering him on, you may be one of those who encourage the bully. And to justify your support for the bully you may think, we need a "strong voice" in our community, a person who will stand up and protect us from outsiders who want to harm us. We need an "outspoken representative," a person who will impress the world with the justice of our faith or cause. We need an "inspirational leader," a person who will make us feel powerful, not defensive. After all, we are at risk of being bullied by the world. We need a bully of our own to fend that off. But a bully in the pulpit is not a proper voice, not a valid representative and not a credible leader. His blustery transparent rhetoric lacks substance. He comes across as weak and insecure and he is easily ignored by the rest of world. To combat a bully in the pulpit you can do some of the same things that people recommend for dealing with bullies in schools or at work. You can try to avoid the bully. Walk out of the chapel when he speaks. Change to another place of worship. In our town, we've seen people quietly withdraw from one synagogue whose rabbi is a bully and join another one, whose rabbi has a proper substantive demeanor that is not intimidating or threatening. Or if you detect pulpit bullying, you can take action. You can speak up and try to end the bullying. You can raise consciousness in your town that bullying in the pulpit exists, that it is counterproductive to the strength and health of the community, and that it needs to be stopped. Published in the Jewish Standard. We said Kaddish for our dad this past year. Some writers responded to their year of saying Kaddish by writing books about it. Four good ones are shown above. We published a popular book about prayer a in July 2011, so we don't feel the need to go ahead and write another one about our Kaddish year. Hannah invites us to examine next the well-known and practiced Kaddish prayer, a second case of the entry level mystic’s prayers. There are several varieties of Kaddish recited in the synagogue, enough to confuse the beginner. One of them, called the Half (chatzi) Kaddish, because a few sentences are left off of it, is recited by the leader of the services as a framing mechanism to mark the end of each major section of the liturgy. And, coincidentally, the term ‘half’ (chatzi) relates to the Hebrew word for a dividing or framing action. The second Kaddish variety, called the complete one (shalem), marks the very end of the services proper. The best-known Kaddish in the synagogue though is the mourner’s Kaddish (yatom), the one that is employed as a mourner’s doxology (i.e., a praise of God). The practice of associating this prayer with a mourner first appears in the thirteenth century. The synagogue authorities endorsed the custom that mourners during the first eleven months after losing a close relative ought to rise and recite a Kaddish on their own. In the case of this Kaddish Yatom, the mourner rises in his place in the synagogue and recites the doxology at a few appointed times in the daily, Sabbath, and festival services. I ask Hannah, What is it that the prayer tells us? And, in particular, what makes the prayer an apt mystical enactment for the mourner who recites it? She explains that the substance of the prayer is not at all philosophical or deep. It is a litany, as a mystical prayer is wont to be, of the right words of praise of God in the correct order. She shows us the mystical component of the Kaddish, those lines that cite for us the adoration that is recited by the angels in heaven. Magnified and sanctified may his great name be in the world he created by his will. May he establish his kingdom in your lifetime and in your days, and in the lifetime of all the house of Israel, swiftly and soon—and say: Amen. May his great name be blessed forever and all time. 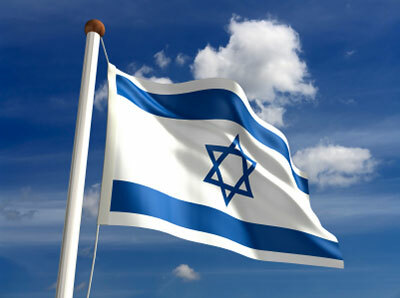 and life for us and for all Israel—and say: Amen. make peace for us and for all Israel—and say: Amen. This lilting and poetic passage does have a certain unique cadence, yet it seems to us in its words to be no more than a standard glorification of God, nothing about death or dying or the deceased. I ask again, why then is this prayer especially apropos for a mourner? Hannah proposes that it is because reciting this heavenly angelic Aramaic praise is the epitome of a mystic’s liturgy. It is a stand-in enactment by the mourner on behalf of the departed loved one. The mourner stands in place in the synagogue and recites the words. But acting in the mode of the mystic archetype, the mourner advances to the next level of mystical prayer. She is not just addressing God with the outpourings of her personal anxiety and vexation, but imagining that she is standing aloft in heaven, representing the soul of her beloved departed, knocking on heaven’s door to seek entry for that spirit into a secure, eternal place close to the divine light and near the warmth of God. I pressed Hannah on this matter. I asked her to clarify to us what is going on when she recites the Kaddish. Is she addressing God from her pew, using the words authorized by the angels on behalf of the deceased? Or is she imagining her ascent to heaven to plead there for the soul of the departed? In the generations immediately following the First Crusade the ceremony of remembering the dead began to be practiced not only in the case of renowned rabbinical martyrs of public persecution but also simply for all who died natural deaths, entirely irrespective of the conditions of persecution. A bereaved son would recite the Kaddish, an Aramaic doxology, for the memory of his recently departed father or mother, in the conviction that such recitation had the power to save the deceased’s soul from tortures beyond the grave. The practice gained headway in the thirteenth century and by the fifteenth a new custom emerged: the Yorzeit, the recitation of the Kaddish on the anniversary of the death of a relative. And soon there was further established the Yizkor or Hazkarat Neshamot, the Kaddish together with various supplications for the souls of the departed, recited on the Day of Atonement and the last days of the Pilgrimage Festivals. Taken together, this amounts of a kind of cult of the dead that began in medieval Ashkenaz and later spread to all of world Jewry. The astounding tenacity of this outlook is observable in the simple sociological fact, known to all, that in the process of secularization, and especially in the acculturation of Jewish immigrants from Eastern Europe to America, the recitation of the mourner’s Kaddish with its attendant rites is the very last particle of tradition to be given up. Ethan Isenberg writes to us that Rav Soloveitchik will be featured on an Israeli Broadcast Premiere Sat night. Lonely Man of Faith will be on Israeli TV in two parts, on successive Saturday nights: April 20 and 27, both at 10 PM. The 18th of Nisan marked the 20th yarhzeit anniversary of the passing of Rabbi Joseph B. Soloveitchik. This year, that date fell out on March 28 - 29. Lonely Man of Faith is available on DVD. Click here to purchase the home version of the DVD. I recommend these books for you! How to have compassion on yourself - my essay, "A Pragmatic Study of Kol Nidre: Law and Compassion"
Just in time for Yom Kippur....Wait. It's not Yom Kippur. It's springtime. We don't believe that you need to wait until the autumn to atone, repent, turn over a new leaf or clean up your act. Call it what you may, April is a good month for cleaning out the garage of your soul. And you can do that via compassion. There is nothing legal or magical about compassion. Release all those vows, those bad habits, bad emotions, bad relationships. So you did some stupid and mean things over the past six months. You are human. Let the bad vows go. Nullify them. Have compassion on yourself and then move on. And so we're happy to announce the publication of Pragmatic Studies in Judaism with an essay by Tzvee Zahavy, "A Pragmatic Study of Kol Nidre: Law and Compassion". This book is the first attempt to apply formal pragmatics to Judaic studies as a discipline as well as within the broader discipline of cultural studies. This paper is a study of the Kol Nidre service using the methods of pragmatics. We show how that service uses legal texts to create liturgy that is designed to be an effective and powerful technology of the sacred for the creation and delivery of compassion. We use pragmatics to examine the context of the liturgy and determine its meaning. We explain the status of the involved worshippers and overcome the ambiguity of the meaning of the prayer by paying special attention to the manner, time and place of its recitation. The ambiguity in the case of the Kol Nidre is whether it is a legal utterance, a magical utterance or a pure liturgical utterance of compassion. We review several previous explanations of the prayer and conclude that with a pragmatic contextual elucidation of the Kol Nidre. Download and read our paper here. The integrity and value of social networks and of commercial product and service reviews depends on the authenticity of the content. Big companies like Amazon and big universities like Cornell and others are hard at work developing policies and algorithms to solve the problem of sock puppet posting of reviews and other content on the Internet. 1. Cornell software fingers fake online reviews: Cornell brainiacs have come up with software that spots fake reviews, something we humans aren't good at. Fictitious happy customers beware. 2. A sock puppet detection algorithm on virtual spaces. Knowledge-Based Systems (January 2013), 37, Complete, pg. 366-377. "On virtual spaces, some individuals use multiple usernames or copycat/forge other users (usually called “sock puppet”) to communicate with others. 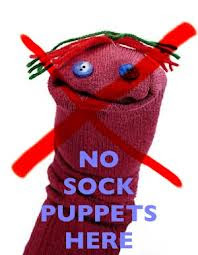 Those sock puppets are fake identities through which members of Internet community praise or create the illusion of support for the product or one’s work, pretending to be a different person. A fundamental problem is how to identify these sock puppets. "In this paper, we propose a sock puppet detection algorithm which combines authorship-identification techniques and link analysis. Firstly, we propose an interesting social network model in which links between two IDs are built if they have similar attitudes to most topics that both of them participate in; then, the edges are pruned according a hypothesis test, which consider the impact of their writing styles; finally, the link-based community detection for pruned network is performed. Compared to traditional methods, our approach has three advantages: (1) it conforms to the practical meanings of sock puppet community; (2) it can be applied in online situation; (3) it increases the efficiency of link analysis. In the experimental work, we evaluate our method using real datasets and compared our approach with several previous methods; the results have proved above advantages." As is often the case in the world of high-tech, social problems can be solved in part by developing even more high tech. We recommend these books for you! The Times reported that golfer Tiger Woods was penalized for an illegal ball drop at the Masters at Augusta, but was not disqualified. He was not disqualified based on a clever Talmudic interpretation of the golf rules. Although he did violate one rule, another rule says that he need not be disqualified for that violation based on his intent and the intent of others at the time of the infraction and at the subsequent time of his signing his scorecard for the round. 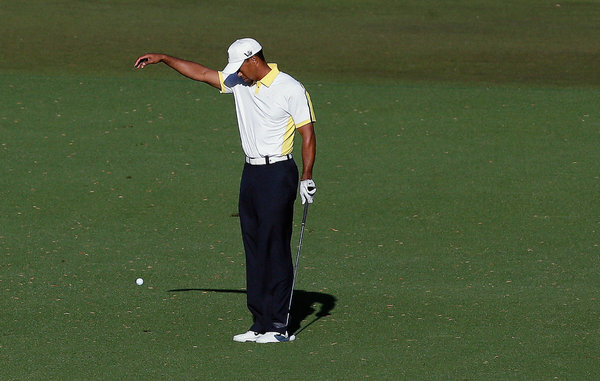 ...On the 15th hole, Woods’s third shot hit the flagstick and rolled off the green and into the water. After taking a one-stroke penalty, Woods dropped his ball in the fairway, a few feet behind his original divot to give himself a more comfortable distance to the pin for his wedge shot. It was a good tactic — his ball stopped 3 feet from the pin — but it also violated Rule 26, which states that when choosing to drop near one’s original divot, a golfer should play his ball “as nearly as possible” at the spot from which the first ball was played. The tireless journalist and spirited blogger at the the Jewish Channel, Steven I. Weiss, revealed yesterday that Rabbi Hershel Goldwasser has been the sock-puppet identity of Rabbi Michael Broyde for twenty years, "An investigation by The Jewish Channel reveals a fake rabbi’s connections to a leading rabbinical court judge." Weiss is a thorough reporter who has no sympathy for supposedly good rabbis who hide their identities to do bad things. In 2005 for example, he reported with care on goings on connected to a rabbi in Teaneck who hid behind a fake identity to rant about the State of Israel in ways that went far beyond the norms of acceptable communal discourse. There's probably nothing criminal in making up a fake identity and having "him" praise your real identity or having "him" express opinions that you are afraid to express yourself, as Broyde did. It is creepy behavior, that's for sure. And there will be those who make the case that it is unprofessional behavior for a rabbi with a leadership position on a Jewish tribunal to engage in this level of deception for this many years. Weiss' report is long and detailed and conveys to this blogger a clear sense that Broyde is rightfully embarrassed to have been exposed. Late yesterday Broyde admitted his charade and tried to apologize for his actions in a strange way on a quirky Orthodox web site, including this final awful attempt at justification, "Basically we were told that given the level of unpleasant discourse in our Orthodox Jewish community, some things just need to be said pseudonymously." Our continued admiration goes to Steven I. Weiss for writing stories such as this one. et me give some background about my mentor, Rabbi Soloveitchik. His followers extolled him with a reverent nickname. They called him the Rav, simply the Master. I consider the Rav to be a master performer par excellence of the synagogue liturgy (when on occasion he led the services), a great pedagogue in the classroom, a scholar of note and interpreter of the substance of the performances of the synagogue. And finally, he was an amazing beginner. In my family, we venerated the Rav above all other rabbis. We spoke of him with the utmost reverence that one would bestow only upon a truly saintly man. And he was one of the great Orthodox rabbis of the twentieth century. He was born into a rabbinic family in Eastern Europe. After mastering all of rabbinic literature, he studied philosophy at the University in Berlin. He was known not just as a rabbi but also as a Gadol—a title reserved for person of the greatest stature in Torah learning and highest authority in Jewish religious matters. As a Yeshiva College senior, I started four years of learning in Rabbi Soloveitchik’s Talmud shiur. In my three post-graduate years of study with the Rav, I earned my ordination and became a rabbi. I received in those four years so much from the Rav: a methodology of learning the Talmud, a theology of Judaism grounded in philosophy, and some secrets of exceptional pedagogy. Let me expand on this last point. The Rav would sometimes, in an occasional moment of gently deprecating and surprising self-reflection, refer to himself as a poshutte melamed, the Yiddish description of a simple teacher of beginners. That statement puzzled me. Surely the Rav was the greatest Orthodox Talmudic sage of his generation. How could he represent himself in this ordinary way? Yes, the pioneering feminist Shulamith Firestone was at the brackets of her life an Orthodox Jew. She was brought up as an Orthodox Jew as a child, and she was buried in an Orthodox Jewish rite. During her life, the radical feminist activities that she engaged in and the critical books that she wrote were as far from the values of Orthodox Judaism as day is from night. The inspiring and haunting New Yorker profile, "AMERICAN CHRONICLES: DEATH OF A REVOLUTIONARY," BY SUSAN FALUDI informs the reader that "Shulamith Firestone helped to create a new society. But she couldn’t live in it." It informs us, "Best known for her writings, Firestone also launched the first major radical-feminist groups in the country, which made headlines in the late nineteen-sixties and early seventies with confrontational protests and street theatre." The article begins, "When Shulamith Firestone’s body was found late last August, in her studio apartment on the fifth floor of a tenement walkup on East Tenth Street, she had been dead for some days. She was sixty-seven, and she had battled schizophrenia for decades, surviving on public assistance. There was no food in the apartment, and one theory is that Firestone starved, though no autopsy was conducted, by preference of her Orthodox Jewish family. Such a solitary demise would have been unimaginable to anyone who knew Firestone in the late nineteen-sixties, when she was at the epicenter of the radical-feminist movement, surrounded by some of the same women who, a month after her death, gathered in St. Mark’s Church In-the-Bowery, to pay their respects..."
IKEA has been caught selling pork as elk meat in their lasagna (April, 2013). That is not kosher. Anyways, yes, elk is a kosher species. JTA reported in July 2008 that yes, you can purchase kosher slaughtered and processed elk meat. Here a recipe for elk steaks. Elk meat is about to become available to kosher consumers. Noah's Ark Processors in South Dakota, which sells kosher meat under the Solomon's Finest Glatt Kosher label, is expecting to slaughter its first elk for the commercial market on Monday. It will be shipped to supermarkets including Fairway and ShopRite the week of July 14, according to owner Ilan Parente. Those stores have been carrying the company's kosher buffalo for the past 10 years, he said. Parente said Noah's Ark has been raising elk for 11 years and exploring the idea of processing its meat for the kosher market for at least six. "It took that long for the rabbis to say yes, it's kosher," he said. 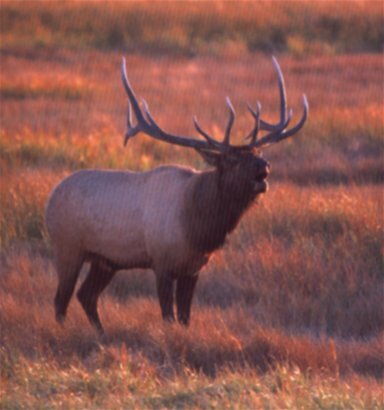 Elk is a member of the cervidae family, which includes deer. Rabbi Seth Mandel, who oversees Orthodox Union-certified kosher meat processing in North America and South America, says this is the first commercial production of kosher elk meat. Although he says elk is "good meat, not as tough as deer," Mandel expects elk to be a specialty product like buffalo that will "take a while" to penetrate the kosher market. "We don't look at it as exotic," he said. "These animals have been here before the cow was introduced to North America. They're native to this country." In addition, Parente points out that elk is "70 to 80 percent leaner than beef, it's tastier and a lot healthier." "Hundreds of thousands of people have held protests in Bangladesh to demand that the government introduce an anti-blasphemy law that would include the death penalty for bloggers who insult Islam." See the video report on AlJazeera. 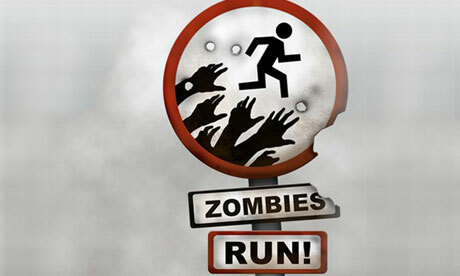 "Mary and the Zombies: Can Science Explain Consciousness?" We like this, been waiting for it for decades. 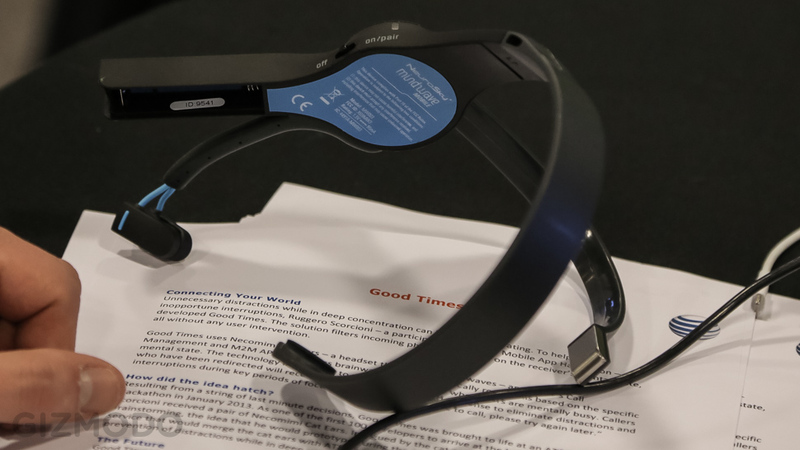 Gizmodo reports, "Automatic Do-Not-Disturb Measures Your Brainwaves to Know When You’re Busy." Italian-born neuroscientist Ruggero Scorcioni has developed a new technology that will help you get stuff done by deflecting phone calls or other notifications away when you're busy. Finally, technology to help keep your brainspace clear when you need it. Ruggero showed us his tech implemented as an app on smartphone at an AT&T event in New York this morning. The technology works by measuring your brainwave activity using a commercially available headset which talks to your phone via Bluetooth. When your activity goes above a certain adjustable threshold, Ruggero's app automatically holds your calls using a publicly available AT&T API. The key to Ruggero's app are the algorithms he uses to process the brainwave data. Beyond simply holding your calls, Ruggero says the technology could be used to hold your e-mail notifications and other interruptions until you've got the mental bandwidth to address them. He won an AT&T hack-a-thon back in January, and used the $30,000 prize to start his new company Brainyno. Here's hoping he finds a way to keep those pesky Facebook alerts from distracting you when you're trying to work. Indeed good news. We have missed our local movie house. Teaneck's Cedar Lane Cinemas will re-open this summer under a new owner according to NorthJersey.com.